On a wild Scottish island, a tragedy washes up on the storm-beaten shore: the bodies of a whale and a man. Fraser, desperate for adventure, and Hayley, visiting from Texas, become tangled in the mystery. But Fraser's younger brother Dunny is distraught by the discovery. He hasn't spoken in years, and lately he's been acting more strangely than ever. Washed Ashore showed up unsolicited on my doorstep one day. I picked it up, shrugged, and read it with basically no expectations about the story (except that there would probably be a whale involved). Now that I think about it, it's good that I didn't read the description too closely because it basically has nothing to do with the actual story. I mean, the bare-bones idea of the bodies washed ashore and Fraser, Hayley, and Dunny's presence in the story is right, but I'm still not sure who the synopsis is talking about what it says that "one of them must learn to listen." I have inklings, but no firm idea. Anyway, moving on. What did I think of the book? I thought it was pretty good. I think it's awesome that it's set in Scotland and written by a guy who lives in Glasgow, because I'm actually moving to Scotland in a few months to attend college in (the essentially small fishing town of) St. Andrews, Scotland. 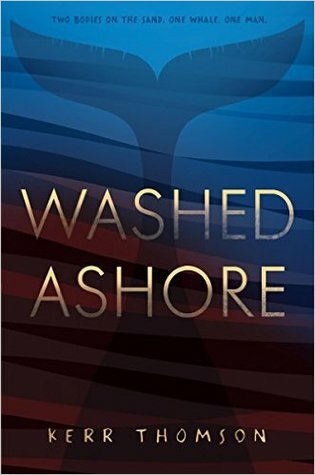 My copy of Washed Ashore actually came before I'd made my final decision to go there, and then I read it soon after the decision was made. That's a pretty cool coincidence! I like getting a peek at what life is like on the small Scottish isles, definitely. Though I have to say that I struggled to connect with Hayley at first–I just couldn't believe that there was no part of her that could stop moping about leaving home long enough to look around and appreciate the fact that she was living among the natives on a beautiful little island in gorgeous-freaking-Scotland! Honestly, travel is simply wasted on some people. The only time she ever seems to acknowledge the "other-ness" of Scotland, besides one time when she notices that the shoreline looks kind of nice, is when she's referring to Fraser as "the Scottish boy." This phrase is thrown around almost constantly throughout the book, and from context I think it's basically supposed to have the same connotations as "the boy next door" (i.e. "the boy we've put a special label on and who will eventually be a love interest for the female protagonist"). Meh. Both of these phrases really don't tell us anything about the boy in question, so I don't really like them. Anyway, the romance plotline is actually handled quite well and I enjoyed watching how all the characters interacted with each other. My favorite character may have been Dunny (who is autistic, though the way Thomson chose to incorporate that into the plot was . . . interesting), just because he seems really sweet and Hayley and Fraser aren't all that nice to or understanding with him. I also felt for Hayley, who is struggling big-time with her parents' separation and upcoming divorce (after her father left them for another woman), and I'm rather horrified about what her mother almost does while on rebound. I liked Fraser least of the three main characters, just because he has the most advantages–knowing everything/everyone on the island, unlike Hayley, and being able to communicate with other people in a way that Dunny can't–and yet is still such a jerk at times to both of them. He's especially thoughtless with Dunny, which is hard to see. Fraser does grow on me, though. As for the plot itself, I can't discuss much without spoilers. There are some interesting themes explored, that's for sure. I can't say that I love the way everything ends up–it's a little too mystical for my tastes–but I suppose that could just be part of the Scottish culture. There are some interesting ethical dilemmas brought up in connection with immigration and the like, which really got me thinking. I can't go much into this here, so I suppose I'll just say that I don't blame immigrants for fleeing hopeless situations but I also think countries should have the right to decide who they admit into their borders. Anyway, though, Washed Ashore was a pleasant book that I enjoyed reading but which didn't blow my socks off. It would make a perfect summer read for any of you still looking for something to pass the time with in the next few weeks. Disclaimer: I received an unsolicited, complimentary copy of this novel from the publisher. Thanks so much, Kerr! I'm very excited to be going to St. Andrews. And my mom and I will actually be heading over a few days early specifically to attend the Edinburgh Book Festival (which looks to be amazing!). I'll definitely keep an eye out for you!